As a child, I was almost always the first one awake in our large and usually noisy family. With the house quiet at dawn, it was easy to hear birds signing outside -- especially in the springtime. I can very clearly recall lying in bed and listening to singing Black-capped Chickadees. What I remember was not so much the "chick-a-dee-dee-dee" call that gives this bird its name, but its plaintive two note whistle. This song is typically denoted in field guides and scientific literature as the "fee bee-ee" song, or by more romantic souls as "Hey, sweetie." However described, for me, it's the epitome of bird song. When I think of birds singing in the morning, I hear a Chickadee fee-beeing in my mind. I grew up in eastern Massachusetts, but it turns out that the location of my childhood chickadee listening is irrelevant to the experience. From Pennsylvania to Northern Ontario and from Newfoundland west to British Columbia and Alaska, Black-capped Chickadees sing exactly the same song. At the risk of insulting the small gray birds with black caps and bibs, theirs is the MacDonald's hamburger of bird songs. Go anywhere and find a Black-capped Chickadee and it will sing the same "Hey, sweetie" song. Most songbirds have specific songs that identify them. If you know what to listen for, it's not hard to tell a Song Sparrow from a Northern Cardinal or an American Goldfinch. The Cardinal's song often includes something that sounds like "birdy, birdy, birdy," for example, and the Goldfinch has a diagnostic "potato chip" vocalization. But usually, the complete song is variable. There are certain syllables that all Cardinals like to sing, but they combine them in different ways. And there are often geographical differences, "dialects," that might distinguish the Song Sparrows of Western Massachusetts, say, from those of Ohio. Black-capped Chickadees have geographic variation in some of their calls, especially in one that's known as the "gargle" call. But they sing the "Hey, Sweetie" song virtually everywhere. The only variation from one bird to the next is in the pitch on which they start the first note. Some birds start higher or lower. But the second note is always lower, and always, it's the same rhythm. One long whistle, the "Hey," and a second at a lower pitch and with a slight break in the middle, the "Sweet-ie." There are a couple of exceptions to this rule about Black-capped Chickadee song, however. 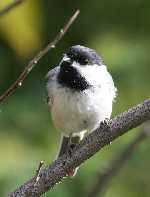 One is found among chickadees in Washington and Oregon. The other is the chickadees of Martha's Vineyard and Nantucket, islands off Cape Cod. Black-capped Chickadees from these islands, identical in every other way to those in our backyards, sing different songs. Most of the island songs are monotonal, in contrast to the two tone mainland song. Some have reversed the usual "Hey, Sweetie" rhythm to sing "Sweetie, Hey." Others focus on one part of the normal song and sing "Hey, Hey," or "Sweetie Sweetie." Still others have added completely new elements. The remarkable thing is that, in sharp contrast to the continent-wide uniformity of "Hey, Sweetie" on the mainland, the Black-capped Chickadees of these islands have different songs just miles apart. At Gay Head, in the southwestern part of Martha's Vineyard, the birds sing "Sweetie, Hey." But go just a few miles east and the local favorite is "Sweetie Sweetie." There are, then, two mysteries about Black-capped Chickadee song. First, why is their song so uniform across an entire continent, more so than any other songbird that has been studied? And second, why is this unusual conformity so startlingly broken on the islands off the Cape? Professor Don Kroodsma, a behavioral ecologist who studies bird song, leads a group at the University of Massachusetts that is trying to figure out the mysteries of Black-capped Chickadee song. Professor Kroodsma believes the answer to the chickadee mysteries may lie in how juvenile males learn the song. Like all true songbirds, a group that includes about half of all birds, Black-capped Chickadees must learn the songs they will sing as adults. Most young songbirds raised in a laboratory will learn the correct adult song just by hearing tape recordings of it. Black-capped Chickadee youngsters, however, seem to need to hear an adult male chickadee singing -- a live tutor -- in order to learn the song correctly. If they only hear tape recordings, the juveniles tend to make up their own song, and a group of juveniles will together make up a new song that they will then all sing. It's possible that this unusual system of young Black-capped Chickadee education results in greater conformity. Of course, it's also possible that there is some other reason for the conformity, and the Black-capped Chickadee's unusual tutoring method is required to maintain such a strong song tradition. That raises the question of what might be enforcing such strict adherence to the "Hey, sweetie" song on the mainland. The answer may lie in what's called "female choice." Bird song seems to be a way for males to advertise to potential mates. By singing, a male Chickadee is essentially saying, "I'm a MALE Black-capped Chickadee. I'm relatively healthy. I'm genetically fit. And I'm ready to mate!" Females listen to the songs carefully, and seem to evaluate the quality of a potential mate based on his ability to sing. For some reason, Black-capped Chickadee females may be especially choosy. Susan Smith, a biologist at Mount Holyoke College, and an expert on Chickadee behavior, recalls one chickadee male who, for two years in a row, paired up with a female and maintained a high rank in his winter flock. His prospects were good until he began to sing in the spring. When he combined the "Hey, Sweetie" song with the "chick-a-dee-dee-dee" call and sang "Hey, dee dee," his mate promptly deserted him for another male. After two years of this embarrassment, he began to sing something closer to the classic "Hey, Sweetie" song, and was finally able to hold onto his mate and successfully breed. So it's possible that female Black-capped Chickadees are more choosy than those of most species. Why that would be so, and why females on Martha's Vineyard would behave differently, are additional mysteries. For now, these Chickadee love song questions remain an interesting puzzle. But it's comforting to me to know that unless I decide to live on the islands off the Cape or in the Northwestern U.S., I will always be able to wake up on a spring morning and be reliably taken back to my childhood by the predictable sound of a Black-capped Chickadee singing "Hey, sweetie."